The guests at the Lanvin show in Paris had all been waiting more than an hour for the presentation to begin, and they were getting restless. This tardiness was out of character for Alber Elbaz, widely considered to be one of the most talented designers around—as well as among the most hospitable. He refrains from trussing models into unforgiving silhouettes that prohibit walking and make the consumption of anything more caloric than Saltines a wild-eyed risk. It would turn out that the reason for the delay of his spring 2011 show was a matter of shoes. Elbaz’s original choreography had the models sashaying down a concrete walkway, about the length of a New York City block, wearing perilous stilettos. Apparently, during rehearsals, the skyscraper heels brought some of the models to tears. So Elbaz dispatched staff to retrieve kinder footwear. The result was a tardy show, but a beautiful one, with virtually half the models—an ethnically diverse lot—in flats. This was all typical Elbaz. So it was with curiosity and confusion that I, one of a handful of black fashion editors, tried to absorb his show’s odd finale and the disorienting audience reaction. 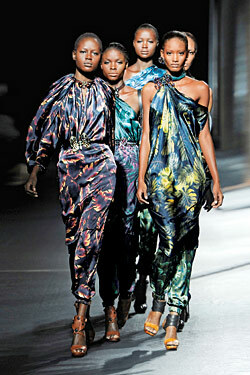 In a presentation that had (philosophically) been about female power and (aesthetically) about layering, the final moments were punctuated by a group of black models all dressed in tropical fern prints. The flora had nothing to do with any other element in the show. And frankly, the clothes were hardly showstoppers. But that didn’t seem to matter, because when the five models marched down the runway en masse—the five black models—large sections of the audience broke into applause for the first and only time during the presentation. They were cheering the black women, but not because they had performed dramatic runway pyrotechnics. They were cheering the women for the great accomplishment of simply being black, which, one might argue, in an industry that remains stubbornly homogeneous in many respects, is a feat worth getting excited about. In fact, when the black model Jourdan Dunn appeared in 2008 in what had been up until then a relentlessly all-white Prada show, I marveled in my blog: “Black girl walking!” It was the first time in more than a decade that I recalled seeing a black model in one of Miuccia Prada’s shows. My enthusiasm and dismay were a throwback to the sixties, when, I am told, black folks called up friends and family to exclaim whenever a person of color was spotted on television. Whoop-whoop! Black people on TV! Black people on TV! But was the group of five a political statement? An attempt at consciousness-raising? What was Elbaz thinking? And, more important, what did it say about the fashion industry? According to Elbaz, the decision was purely aesthetic—a solution to a creative conundrum. He adored the prints but knew they posed a jarring juxtaposition with the rest of the collection. A more disciplined designer, he said, would simply have edited them out. So, in his search for a way to display them that would make sense, he hit upon the idea of using the black models. They would form a visual addendum to the main collection. They would be separate. But equal. In short, Elbaz’s decision had nothing to do with race. And yet, it had everything to do with it. And so it goes in fashion. The industry sees itself as open-minded and progressive. (Yes, it’s judgmental about your weight, your hair, and your clothes, but it judges everyone.) So it aims to treat race like any other aesthetic touchstone, as unremarkable as red hair or a cleft chin. Race is little more than “a paint chip,” former fashion publicist Susan Portnoy, who worked for Nicole Miller and Oscar de la Renta’s Oscar line, once told me. The fashion world considers itself so cosmopolitan and sophisticated that it can play fast and loose with racial stereotypes—occasionally shattering them, sometimes benefiting from their stubborn existence. Fashion folks naïvely—bravely?—attempt to be racially blasé in a culture that still struggles with the burdens of prejudice and the wounds of history. As a result, the fashion community in general often comes across as bumbling on the topic of race. It gets tripped up by ignorance. Fashion editorials can be thoughtful and exasperating—sometimes in the same breath. The head-scratching experience at the Lanvin show was just another chapter in a story that never seems to end. After putting out its much-talked-about all-black issue in July 2008, Vogue Italia came back with a separate website dedicated to black style and, in its latest issue, an all-black editorial. In 2009, French Vogue ran a story featuring a model in blackface. This past summer, Essence, the premiere lifestyle magazine aimed at black women, hired a white fashion editor, sparking much debate. And then, of course, there’s Michelle Obama. Nowhere has she been greeted with more enthusiasm and respect than in the fashion world. The industry elevated her to the status of icon. She wears a cardigan, and it sells out. She wears a gown by a non-American designer, and debate rages for weeks. Given a bit of time, designers may find themselves inspired by her in the same way they’re energized by Jackie Kennedy, Babe Paley, or Countess So-and-So und So-and-So. The only problem is that while they’re busy celebrating this singular woman, they’re not too keen on understanding what it’s like to be the only black person in a room filled with white folks. The history of blacks in the fashion industry has only occasionally been addressed in detail. Beverly Johnson was the first black model on the cover of Vogue, in August 1974. The popularity of black models continued through the eighties and early nineties with women such as Iman, Naomi Campbell, Tyra Banks, Beverly Peele, and Veronica Webb. With the rise of the waifs in the mid-nineties, however, black models disappeared. Ivory-skinned Brazilians and then Eastern Europeans replaced the waifs. Now black models are on the upswing, with Liya Kebede, Chanel Iman, Sessilee Lopez, and Jourdan Dunn among them. In 1992, the Museum at F.I.T. mounted an exhibition in honor of the Black Fashion Museum, whose collection of more than 1,000 artifacts recently was donated to the Smithsonian’s National Museum of African-American History and Culture, which is scheduled to open in 2015. In 2004, Thelma Golden curated a retrospective on the late Patrick Kelly at the Brooklyn Museum of Art. In 2006, the Museum of the City of New York mounted “Black Style Now,” an exhibition that focused, to a great extent, on the rise of hip-hop. But the country’s premiere fashion museum, the Met’s Costume Institute, has been mostly mute on the subject. This January, however, the Met hosted a luncheon in the Temple of Dendur in celebration of the models of the Palace of Versailles. These ten women of color participated in the famous fashion smackdown of 1973, when ten designers—five American and five French—presented their collections in a grand fête benefiting the restoration of the historic site. The American designers won the audience over on the strength of the black models, who dazzled the French audience with their powerful runway presence (a precursor to the Lanvin fashion moment?). Alva Chinn, Norma Jean Darden, China Machado, Pat Cleveland, and Bethann Hardison were among the original models, and they gathered for an afternoon of stories, good wishes, and proclamations. Designers Oscar de la Renta and Stephen Burrows, who had both participated in the historic show, hosted the event. After lunch, De la Renta and Burrows came to the podium to reminisce. When De la Renta asked if there were any questions, Teri Agins, a longtime fashion journalist, asked Burrows to discuss what it was like being the only black designer participating in the show. Indeed, it was Burrows who’d encouraged the Americans, who also included Bill Blass, Anne Klein, and Halston, to use the black models. But De la Renta took the microphone. Burrows, he said, was at Versailles because he was a great designer; race had nothing to do with it. De la Renta added that he was tired of people making distinctions based on skin color. He was, for example, fed up with being told that he should take a look at some beautiful “black model.” Why can’t she just be a beautiful model? Remove race from the description altogether, he said. De la Renta, who was born in the Dominican Republic, was making a heartfelt argument for color-blindness. What is it like being the only black editor, designer, publicist in the room? I recall walking into a luncheon at the Joseph Abboud showroom some years ago. I was the first to arrive, and a white valet waited in anticipation of the guests. I said hello. He nodded but said nothing, and did not offer to take my coat. Within moments, however, a group of white male colleagues arrived, and I watched as the valet immediately jumped into action, checking their coats and bags. I waited, and when it seemed he had no plans to come to my aid, I finally said, “You can take my coat now.” Without comment, he did. Did he think I was a delivery person? The help? Or was he just hopelessly distracted and unprofessional? Tracy Reese, arguably the country’s most visible black designer, was recently invited to a reception for underprivileged high-school students. “I was the only person of color, except for the youth and maybe one faculty member. The organizers were sort of urgent about my being there,” Reese says. “Sometimes you’re needed in the mix for whatever reason. I don’t internalize it, but I do a calculation in my head: Probably I’m here because of A, B, or C. Probably that’s wrong of me. When Viktor & Rolf put models in blackface and body paint, should I not have been horrified? The global nature of fashion means everyone isn’t hauling around the same societal baggage. France embraces “exoticism” and has a history of welcoming expatriate black artists. In Holland, the Dutch closely associate blackface with “Black Peters,” who, tradition holds, are Santa’s little helpers; at Christmastime, revelers dress up in blackface. (The practice now is greeted with some ambivalence, as many argue it references the country’s involvement in the slave trade.) So, in 2001, when Dutch designers Viktor Horsting and Rolf Snoeren put their models in blackface and body paint for a collection focused on “silhouettes,” should I not have been horrified? I contributed an essay to Vogue Italia’s “A Black Issue,” and in it I discussed my own ambivalence about the project. I was happy to see such an artful and focused celebration of beautiful black women. I wasn’t bothered that they all appeared in a single issue; editor Franca Sozzani was making a powerful social statement through the act of segregation. But my concern was that once “A Black Issue” disappeared from newsstands, black models would as well. Aesthetically, Sozzani’s argument makes sense. But there’s a reason the standard all-white editorial isn’t described as a ghetto. There’s a reason no one talks about the oppression of blondes. Or the lack of redheads on the runway. The aesthetics of race can’t be wholly separated from the baggage of oppression, inequality, prejudice, and stereotypes. At least not yet. Mrs. Obama may be the patron saint of the fashion industry (and, arguably, Annie Leibovitz images of Michelle Obama channeling Camelot served as a political balm for a public adjusting to the idea of a black First Lady), but anyone who enters the blogosphere knows that the Obamas’ presence in the White House has not eradicated racism. In some ways, it is more vitriolic than ever. Other creative fields—visual arts, music, film, literature—seem to understand this. They wrestle with the complicated nature of race all the time, even as they also stumble. But the fashion community tends to play dumb or be disingenuous. It treats race like “a paint chip,” even while benefiting from the undercurrent of racial tensions that permeate our society. Recognizing the power of race—and the accompanying stereotypes—has led to some of fashion’s most glorious images. Part of what made the Polo Ralph Lauren advertisements featuring Tyson Beckford so compelling and groundbreaking was the contrast between Beckford’s mahogany complexion and the classic Waspiness of the clothes. The ads bucked a multitude of cultural clichés. Vogue also used assumptions about race and urban style to great effect when it photographed Sean Combs as an elegant Cary Grant figure for a couture story. The fashion bible bought into the subversive image that Combs had begun to craft of himself as a Hamptons-dwelling mogul who vacationed in St.-Tropez. And Liya Kebede, on the runway during Tom Ford’s reign at Yves Saint Laurent, expertly merged the “exoticism” of the brand’s past with the multicultural realities of the present. Fashion pushes at the boundaries of political correctness in the name of creative freedom and buzz. But it often does it in a manner that is impish, sly, timid, and, at times, seemingly downright deceitful. How many times must we see a white model dressed in designer fare cavorting with the brown-skinned locals in India or Africa? Those who lead the cultural conversation about beauty, gender, and class biases can be shockingly uninterested in carrying on a dialogue about race—or simply unwilling to do so. I say, if you’re going to play with stereotypes, do it openly and honestly. After all, sometimes the culture needs to be challenged, even angered. Which is why I couldn’t muster the kind of outrage so many did for a much-discussed magazine cover. The 2008 Vogue issue featuring LeBron James and Gisele Bündchen played with the cliché that black men are all brute strength and voracious appetites. Protect your white women! As James put on an expression of visceral emotion and Bündchen played the damsel gripped in his enormous hands, the power of the image came from the stereotypes. Some people were offended and compared it to an old King Kong poster. I had never seen the poster, but even when it was brought to my attention, I wasn’t offended. Indeed, in light of the poster, I found the image of this multimillionaire black male icon dominating the cover of the most mainstream of women’s fashion publications even more intriguing and provocative. So, is the recent fascination with putting white models in blackface and body makeup also ahead of the curve? “I hope not,” Talley says.